A late boss of mine used to say “We all know the time when education in this country started to go downhill; it was the day after each of us graduated.” I am trying to not let nostalgia influence my views of the current labor market and prospects for job and economic and growth. 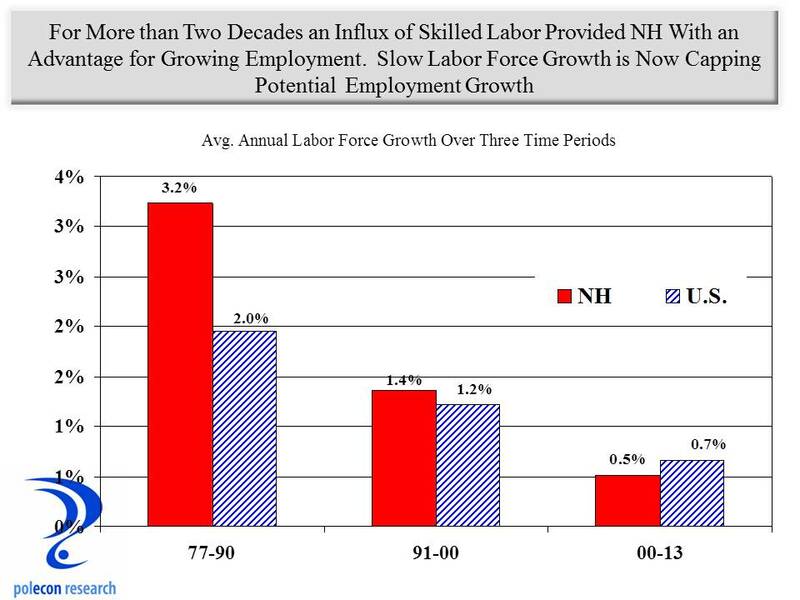 In prior posts I have tried to make the case that slower labor force growth (and to a degree a skills gap) is the fundamental factor constraining growth in the NH economy. In my last post I wrote: “Looking ahead, population and demographic projections show that both nationally and in NH, the working age population (defined here as age 18-64) will show almost no growth over the next 25 years.” If that was written in another’s blog I would have dismissed it if it was not empirically supported, especially if it was as fundamental to the analysis as it was in my post. Regardless of whether you agree with or have even read the analysis in that post, the population and labor force trends it references are keys to understanding critical obstacles to future economic and employment growth. 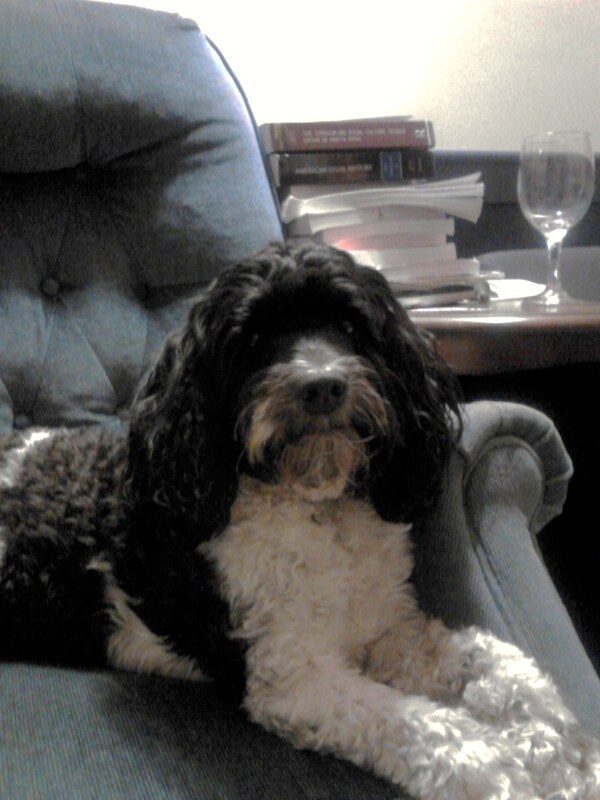 In this post I provide some documentation and my interpretation of those trends. It is important to make the distinction between growth in the “working age population” (which my prior post referenced) and “growth in the working age labor force,” (which is a more appropriate measure for the main thesis in that post.). While the two measures move in the same direction, the magnitude of change can differ as the age composition of the population changes and as trends in labor force participation among different age and demographic groups change over time. Longer-term trends (as opposed to shorter-term or cyclical trends – those affected by business and economic cycles) in labor force participation can mitigate or exacerbate some of the population trends affecting the size of the labor force. First, let’s look at the assertion from my prior post that: “the working-age population …..will show almost no growth over the next 25 years.” That is a remarkably imprecise statement on which to base any analysis and its accuracy depends on your definition of “almost no growth,” as well as how you define the working-age population. The chart below shows the U.S. Census Bureau’s “middle scenario” for U.S. population growth to the year 2060. In the chart I show four definitions of “working-age population” along with the cumulative growth rate of each. Three of the four definitions begin at age 22 to reflect the adult working age population. The three definitions include: ages 22-64 that recognizes a historical traditional retirement age at 65, as well as two others (ages 22-69 and ages 22-74) that reflect mortality, health, occupational, and retirement trends that have many individuals working beyond traditional retirement ages. To show that adding the younger population has relatively little impact on the trends I include a traditional definition of working-age population that includes individuals ages 16-64. 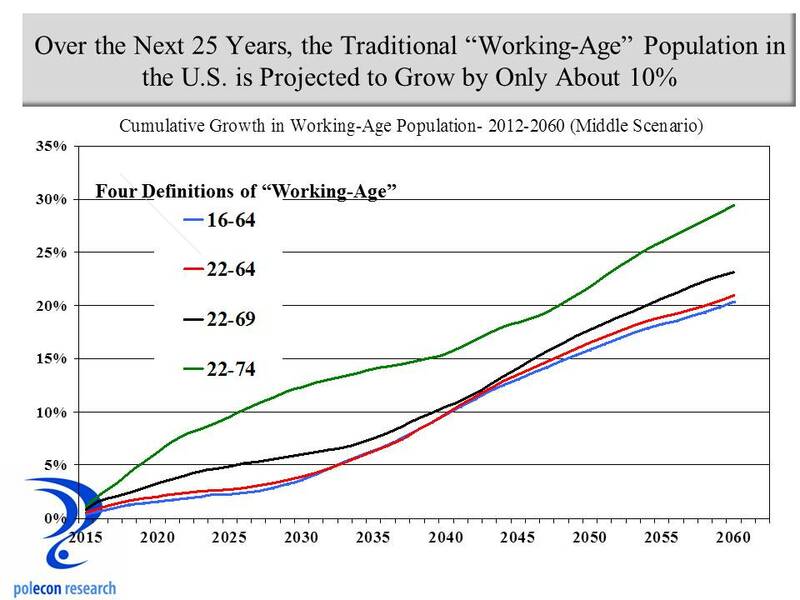 The chart shows that the “adult working-age population” is projected to grow by about 10 percent over the next 25 years (between 2015 and 2040) in the first two (more traditional) definitions of working-age and by a much larger 15 percent for the definition that extends “working-age” population to ages 22-74. “Almost no growth” may overstate the decline in the rate of growth but, for me, 10 percent growth over 25 years is pretty close to almost no growth, especially by historical standards. 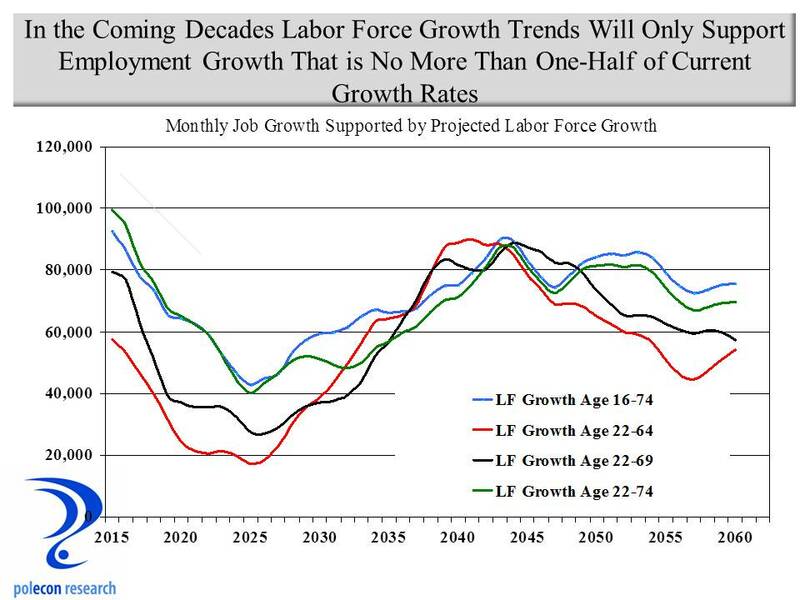 I think the chart highlights the important role that older individuals could play in employment growth in the future. I like to call this the “revenge of the baby boomers” who first entered the labor market in competition with large numbers of other boomers and who experienced resulting demand for their labor that could not always keep up with the big increase in supply. Much later in life boomers who wish to continue working will likely see demand for their labor higher than it has been in the past for older workers. How growth in the “working-age” population translates into growth in the labor force is a function of the age composition of the labor force and the labor force participation rates among the different age groups in the population. Participation rates are highest between ages 25 and 54, much lower among teenagers, lower among 22-24 olds and much lower and declining at ages 55 and above. Thus when the population is growing in high participation age groupings (between 25 and 54) labor force growth will grow more similarly to population growth than when more of the growth in population is among younger (under 25) and older (55+ individuals). That is illustrated in the following two charts. 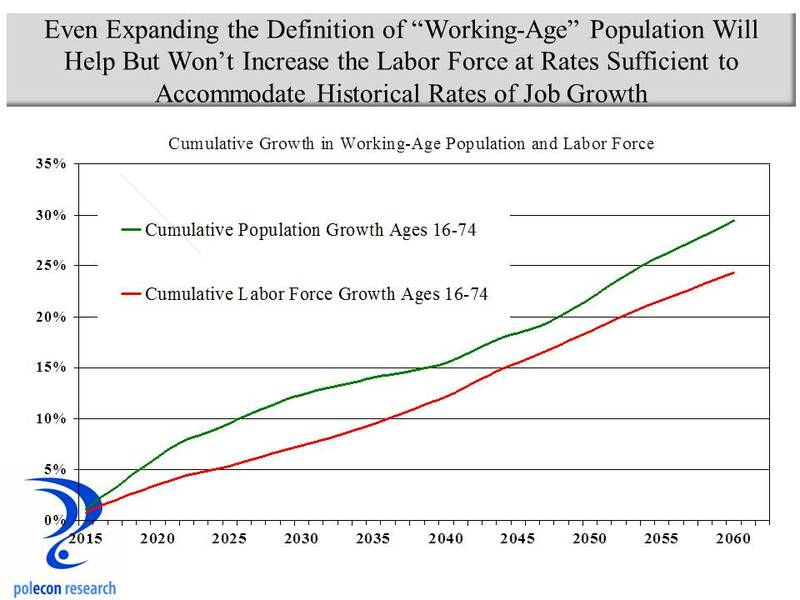 The chart below compares cumulative population and labor force growth between 2015 and 2060 in the broadest definition of “working-age population” which here includes ages 16-74. Labor force projections incorporate a forecast of an increase in labor force participation rates for all age groups above age 55 (averaging about a 5% increase in participation rates) consistent with projections of participation made by the U.S. Bureau of Labor Statistics. The increase in labor force participation among individuals aged 65 and above is not simply a result of individuals who are not able to financially retire (although that does play a role), it is also a function of the better health of older individuals and a decrease in the percentage of jobs in the economy that are physically demanding, among other factors. For age groups in the middle age ranges there is a slight decline in participation rates (averaging about 0.4%), and for the youngest age groups a decline averaging 3.6 percent. Combining the age distribution of the growth in the working-age population with trends in labor force participation shows that actual labor force growth among the population ages 16-74 is going to be much smaller than population growth because so much of the population growth will be among age groups with the lowest labor force participation rates. 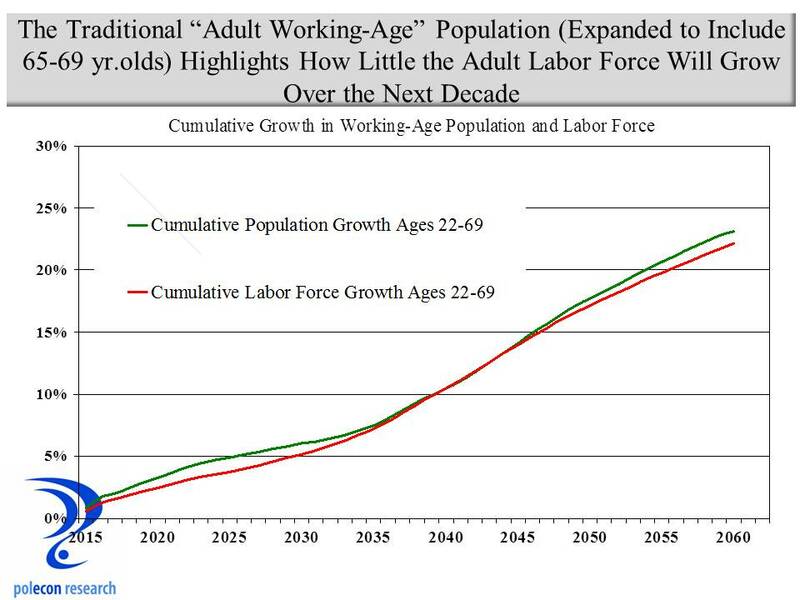 When a the “adult working-age population” is examined (including ages 22-69), little difference between the cumulative population and labor force growth is seen, with time periods where growth rates are identical and some during which cumulative population growth is slightly higher.. This occurs because the combination of growth in the ages 55-64 population and an increase in the labor force participation rate of this age group compensates for the decline in participation among the youngest age groups and slower population growth in the high participation age groups (25-54). Each of the graphs above show a labor force that is growing nationally (in fact some states will likely see an outright decline in their labor force). Because the charts show labor force growth it is easy to miss the significance of a slower rate of labor force growth on the U.S. economy and future job growth. Over the past three years the average monthly job growth in the United States has averaged about 200,000 jobs. Real labor force growth hasn’t been sufficient to accommodate that level of growth but because of the layoffs in the labor market during the recession there was enough slack (unemployed individuals and individuals temporarily out of the labor market) in the labor market to allow for that level of job growth. Eventually that slack will be taken-up and job growth will be more constrained because of labor force growth and wages will rise in response to tighter supply (that is just beginning to happen). That was the essence of my thesis about the interaction between NH’s business taxes and demographic and labor market trends. During the non-recessionary years of the 1990’s the average monthly job growth in the U.S. was about 243,000. Those monthly job growth numbers include jobs going to individuals below the age of 22. While my analysis primarily is concerned with the adult working-age population (ages 22+), including the labor force ages 16-21 into the analysis changes the population and labor force growth trends very little. Even including individuals ages 16-21 into labor force projections labor force growth will not support an increase in 200,000 plus jobs in the coming decades (except following a recession when substantial layoffs and slack in the labor market exist)..
To illustrate that point the chart below translates the annual increase in the nation’s adult labor force into a potential monthly job growth for the nation (if all of the increase in labor force were employed) under four definitions of the labor force. The chart shows that under a traditional (ages 22-64) or a maximum expansion (ages 16-74) definition of the labor force, annual growth will not sustain current or historical rates of monthly employment growth. During years of the highest labor force growth, jobs would grow only at about one-half the current monthly rate of job growth in the U.S.
Long range forecast and projections are always problematic but the scenario of slower labor force growth and greater competition for labor outlined in this and my previous post will play out even if the degree to which it does has some uncertainty. Despite the overall U.S. trends it is important to note that population and labor force growth will vary greatly among states. Unfortunately NH and other Northeastern states currently are confronting trends that are on the negative end of the spectrum for population and labor force trends. When the percentage of women in the labor force increased dramatically beginning in the 1970s the labor market was fundamentally changed and the growth potential of the economy was given a tremendous lift. There are no equivalent transformative changes on the labor market horizon. More individuals will work later into their lives but it won’t have the same economic effects as did the increase in labor force participation among half the nation’s population. In addition there has been on ongoing trend of declining labor force participation rates among young people that is, in large part I believe, attributable to the increase in post secondary school enrollments over the past few decades and this partially offsets increases in participation among older individuals. Perceptions of the need for and value of a at four-year college degree are increasingly being challenged so it is possible that the trend of lower labor force participation rates among the young may begin to reverse. The scenario presented here is based on the assumption that current international immigration and state-to-state migration trends will continue unchanged into the future. It is possible that if labor shortages are severe enough in the northeast, we would we see increased net migration into the region, and once again into NH. But the potential pool of labor which NH can attract will be growing more slowly, making attracting “talent” to the state ever more challenging. That is one reason why I stress the importance of making states and communities attractive to individuals (of all ages) as well as attractive to businesses. Net inter-state migration to NH will likely increase from recent low levels, however, only if the state and its communities offer enough of the amenities and enough of a value proposition to justify that net in-migration. Finally, it is also possible that labor shortages will spur action to increase rates of international immigration to the U.S.. 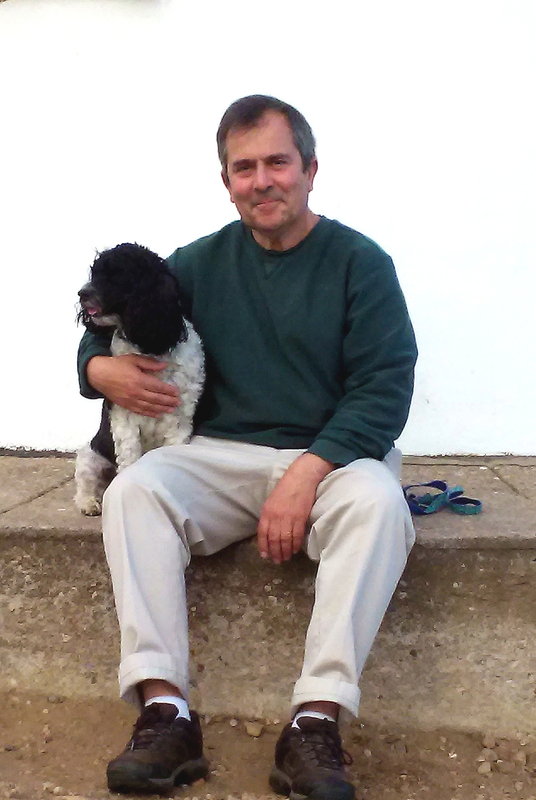 Prediction is indeed very difficult – especially when it is about the future. and especially when it involves a long horizon and as many variables as do population and labor force growth. But for now, my money is on the scenario outlined in this and my previous post. What to do about New Hampshire’s business taxes is near the top of lawmaker’s agenda in the Granite State. Many policymakers are concerned that the business tax climate is contributing to a fundamental erosion of New Hampshire’s business climate that is reflected in lackluster employment and revenue growth. Reports that NH has recently outperformed New England and the U.S. in gross state product (GSP) growth highlight the disconnect that can occur between economic metrics of output (GSP) and measures that more directly affect individuals in their daily lives, such as employment and wage growth. Better than regional or national average growth in GSP is good but state-level GSP numbers are relatively imprecise and should not obscure the fact that employment, wages, and state revenue growth have all been disappointing in NH by the standards of the past few decades. Sustained, disappointing employment and revenue growth since the end of the recession have prompted well-meaning lawmakers in NH to consider a number of policies to accelerate growth in the state. Business tax rates impact business decisions but I don’t believe they are the fundamental factor behind NH’s disappointing economic performance. Lawmakers should consider “what to do about business taxes” but that consideration should go well beyond current tax rates and regulations. Lawmakers should also be concerned with the long-term prospects (revenue yield) of business taxes because business taxes are the largest source of general revenue supporting state government. New Hampshire’s fiscal structure is fundamentally tied to the performance of the state’s business taxes. As importantly, lawmakers should be concerned with how NH’s business taxes will interact with key economic and demographic trends to influence the state’s future economic performance. 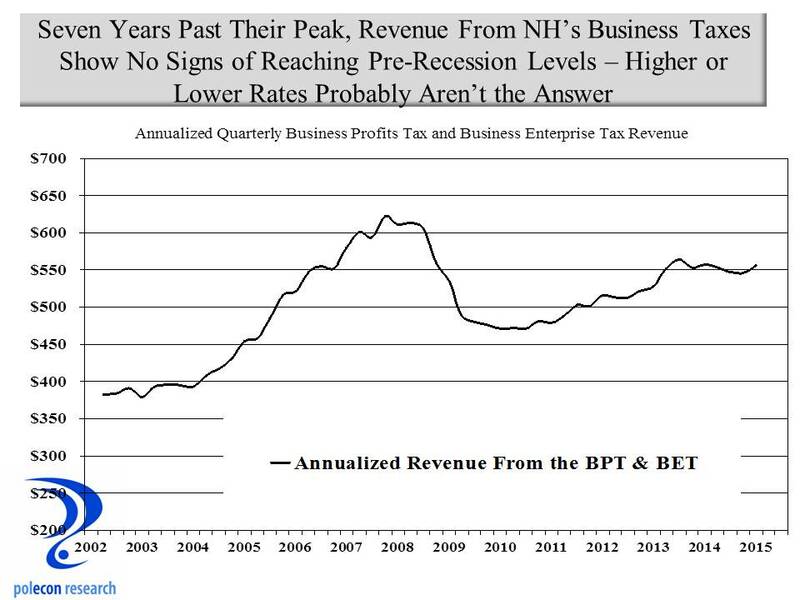 The chart below shows combined quarterly business profits and business enterprise tax collections on an annualized basis and illustrates that nearly six years post-recession and more than seven past their high mark, business tax revenues in NH have not fully recovered. Some of the failure of revenues to rebound following the recession is a result of changes in the state’s business tax rules and some is the result of total private sector wages and salaries (the largest portion of the BET tax base) that declined in 2009 and 2010. Whatever the reason it highlights concerns about the viability of business taxes as the primary source of support for state government. I don’t believe that either raising or lowering rates is likely to improve the performance of business tax revenue enough to alleviate those concerns or even result in revenue gains that match those seen in the first half of the 2000s. Using tax rates to measure burdens over time is not a true measure of the impact that business taxes have on companies. Comparing state business tax climates using rates is problematic because of the various provisions of each state’s tax code that affect nominal rates. Here I assess business tax “burdens” using an economic measure – business tax collections as a percentage of private sector gross state product (GSP). This metric documents the state’s business tax burden placed on the total value of private sector goods and services produced in a state. Even using this measure of “burden” is problematic because it does not include all of the taxes, fees, and charges that may apply to a business in each state. Nevertheless, when it comes to addressing the primary sources of tax burden and the ‘headline taxes” that are identified with a state’s business climate, it is a better measure than looking at just business tax rates. 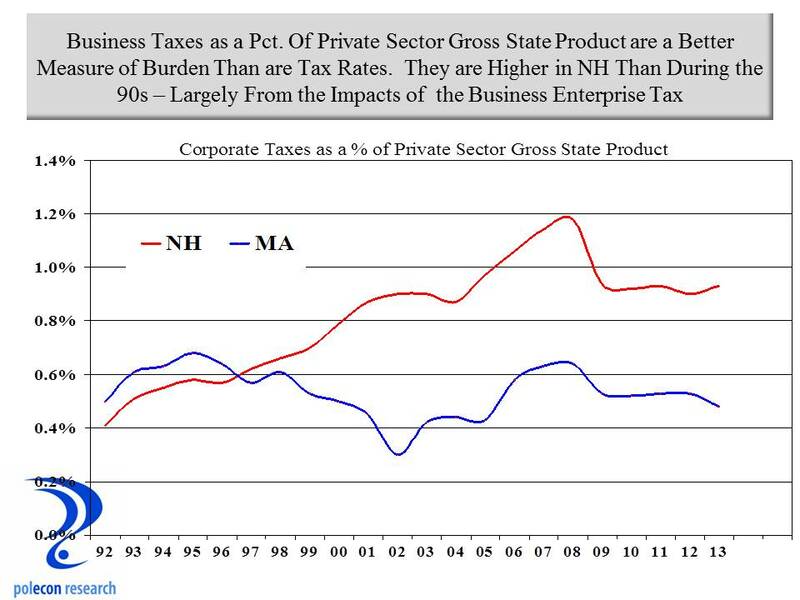 As the chart below shows, as a percentage of GSP, business tax burdens have nearly doubled in New Hampshire since the early 1990’s. Much of that is the result of the addition of the Business Enterprise Tax in 1993, as well as increases in the BET’s rate from 0.25% to 0.50% in 1999, to 0.75% in 2001. But some is also the result of increases in the rate of the business profits tax (BPT) which began the time period shown at 8.0% (from FY 92 through FY 93), dropped to 7.5% in FY 94 and hit a low of 7.0% (from FY 95 through FY 99) and finally rose to its current rate of 8.5% in FY 02. Importantly, the chart also shows that business tax revenue as a percentage of private sector gross state product has fallen since the recession and is now at a level seen at the beginning of the last decade. Again, changes in rules and a decline in wages and salaries both play a role in that decline. For comparison purposes the chart also shows the percentage of GSP that corporate income taxes take in Massachusetts, however, as noted, a number of other taxes are applied to or affect business in addition to corporate income taxes. What’s Ailing the NH Economy? I don’t believe there has been a substantial, fundamental erosion of the ‘business climate” in NH. 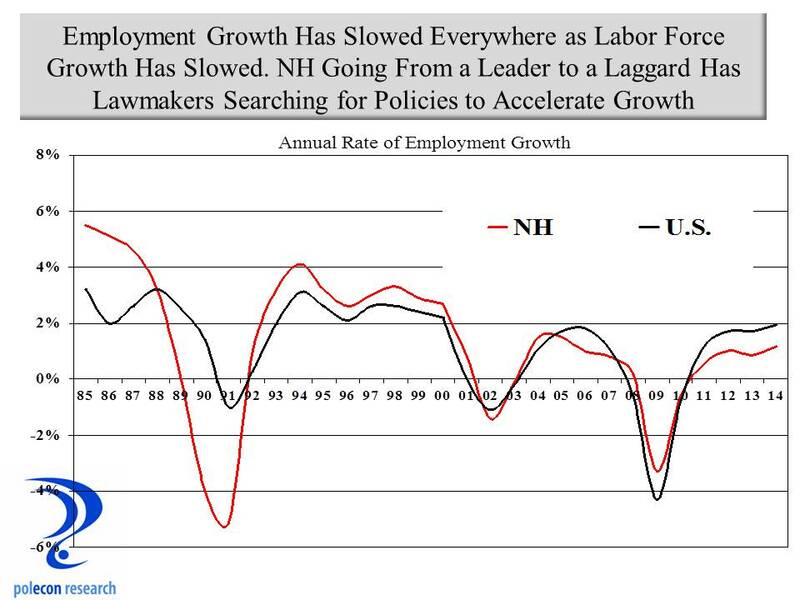 Slow labor force growth is by far the largest factor contributing to New Hampshire having gone from a leader to a laggard in job growth. That labor force issue is much broader and more complicated than the simplistic and too often noted “young people moving out-of-state.” The chart below shows that labor force growth has slowed more in NH than nationally in recent decades. Where once NH enjoyed a significant advantage in labor force growth, the state now lags the nation as a whole. Above average labor force growth is what allowed NH to have exceptional job growth in the 1980’s and much of the 1990’s. Labor force growth (largely via in-migration of skilled, educated individuals and families from other states) provided NH with a resource advantage for decades. Slow labor force growth is now capping the amount job growth that is possible in the state. Some believe the state’s labor force would experience stronger growth if more job opportunities existed in NH and that simply reducing business taxes will make that happen. While that is true to a degree, today, businesses rarely locate where there is not clearly a sufficient supply of needed labor. 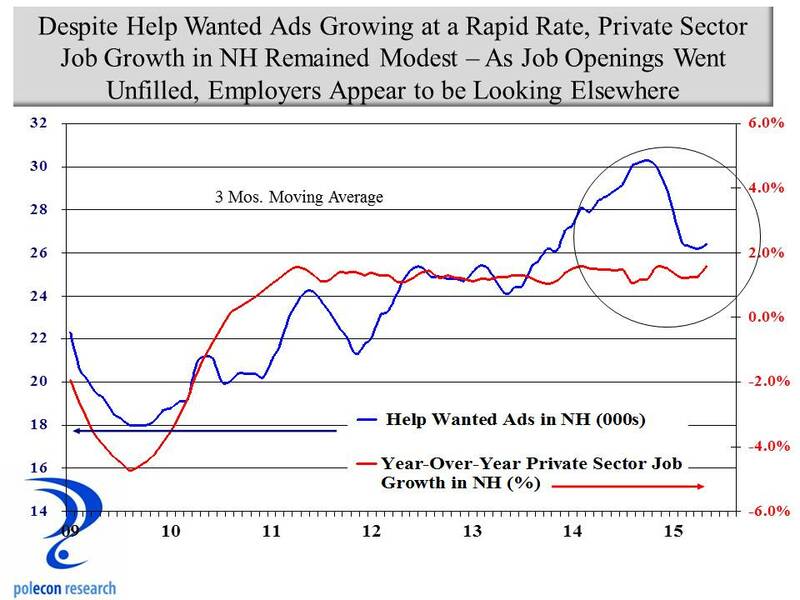 A sharp rise in help-wanted advertising in NH in recent years even as private sector employment growth has remained relatively constant and disappointing (chart below) shows that in the near-term at least, demand for labor does not necessarily increase its supply. Significantly, the chart also shows that after a rapid rise in help wanted advertisements that was not accompanied by a noticeable increase in the rate of private sector job growth, help wanted ads have begun to decline in what may be a sign that employers, because of labor supply constraints, are increasingly looking elsewhere for labor. The demand for labor does generally increase the supply of labor but when the supply is growing slowly everywhere (especially in the Northeast where NH has typically attracted much of its increase in labor force), supply will respond accordingly. Increasingly businesses follow labor rather than the other way around and they do not rely on their demand to increase labor supply. Looking ahead, population and demographic projections show that both nationally and in NH, the working age population (defined here as age 18-64) will show almost no growth over the next 25 years. Competition for labor among businesses will become more intense and to keep and attract a labor force businesses will have to offer more than just the promise of a paycheck. 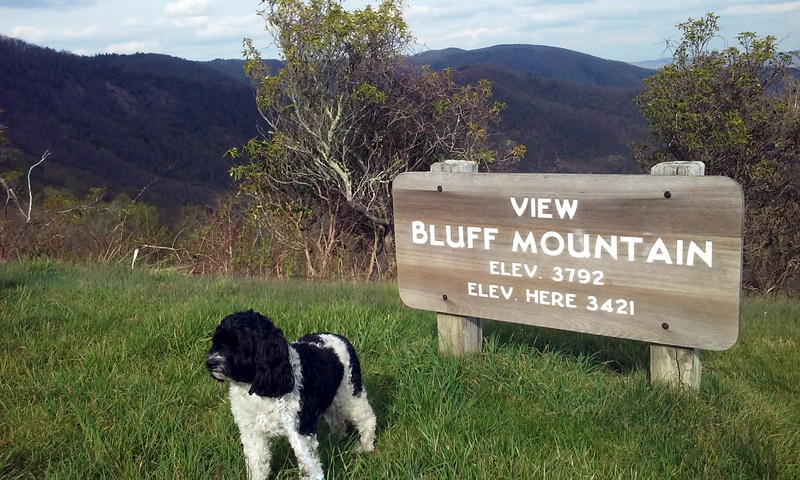 I would argue that states and communities will also have to offer more (in terms of amenities – natural, social, civic, cultural, and services) to attract and retain the labor force needed for employment and economic growth. Evidence of the importance of amenities to labor supply (and employment growth) can be seen in the differential employment growth between some of NH’s regions such as the Seacoast (which has had higher population, labor force, and employment growth and which has several high amenity communities) and other regions of the state. New Hampshire can improve its business taxes and business climate but whatever reforms are enacted, alone, are not going to overcome demographic and labor force imposed constraints on employment growth in the state. Lawmakers should, however, seek to assure that business taxes do not worsen key constraints on the NH economy moving forward. NH’s combination of a traditional tax on the profits of business profits (the business profits tax or BPT), along with its “business enterprise tax” or BET (on the combined compensation, interest, and dividends paid by businesses) may well exacerbate some of the disadvantages the state’s economy will face as a result of national and state demographic trends, making it more difficult for NH to overcome key constraints on employment growth in the state. Reducing business tax rates that many see as too high is a near-term solution to a longer-term problem. The longer-term problem is slow or no labor force growth nationally and in NH in the coming decades that will limit profit growth everywhere but which will also place additional burdens on NH businesses. The labor force problem and NH’s reliance on business taxes will present NH businesses and state government with challenges that are unique to the state. Wages and salaries are generally lower for comparable positions in NH than they are in Massachusetts. At one time it was easy to justify that wage differential because of large differences in the cost of living between the two states. Today, the cost of living differential between the two states has narrowed and NH is considered a high cost-of-living state. The U.S. Bureau of Economic Analysis (BEA) produces a “regional price parity index” Regional Price Parities (RPPs) measure the differences in the price levels of goods and services across states for a given year. RPPs are expressed as a percentage of the overall national price level (100). 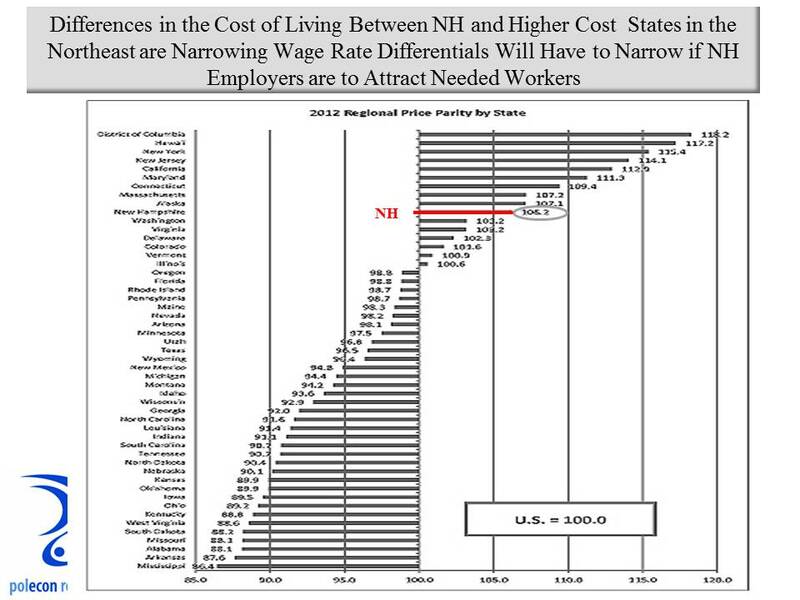 As the chart below shows (apologies for the poor quality – I lifted it directly from a BEA publication), NH (seen in red) has become a high cost state (largely because of housing costs), nearly as costly as Massachusetts. In a state (NH) with living costs that are increasingly comparable to Massachusetts, workers in NH can be expected to seek wages nearly comparable to wages available in Massachusetts. For the most part, however, NH employees do not receive wages comparable to wages in Massachusetts and that contributes to some of NH businesses inability to hire needed workers and to NH’s modest job growth, despite increased job openings in the Granite State. It may also be a contributing factor to NH’s significant drop in its unemployment rate with only modest job growth (the unemployment rate is a residency-based measure that considers only whether or not a resident of NH has a job or not, regardless of where that job is located). Little or no growth in the labor force in the coming decades will increase competition for workers and will put more pressure on NH businesses to narrow wage and salary differentials with other, higher-cost states, if higher-skill jobs located in NH are going to grow. The catch 22 is that higher wages increase the BET liability of businesses at the same time they can reduce profitability (if productivity isn’t rising along with wages). A growing disconnect between the profitability of businesses in NH and the tax burden placed on them is not likely to be an incentive for businesses to compete for labor in a era when it is ever more scarce. Higher wages would not be a problem as long as productivity increases justify wage growth. When workers produce more they should see higher wages. Productivity growth has been modest over the past decade and shows little sign of accelerating. Thus increasing wages will likely mean slower profit growth for businesses in NH and elsewhere. I think we have seen the high mark nationally for corporate profitability for some time. But in NH, the higher wages needed to attract labor will also increase the business enterprise tax (BET) liability of companies. If profitability is indeed more modest because of faster wage growth and modest productivity growth, the BET liability of NH businesses relative to their business profits tax (BPT) liability will increase. An ad valorem tax on a resource (labor) in short supply with a rising price and that is paid regardless of the profitability of a business may increase (or cushion from decline) state revenue for a time but it also seems like a disincentive for businesses to pay the wages necessary to compete for labor and to hire in New Hampshire over the longer term. New Hampshire’s tax structure has never really been a boon or an advantage for business but it has been attractive to large numbers of individuals and families over the years and it contributed to growth in the state’s labor force via inter-state migration into NH. Growth in key demographic groups within the labor force – skilled individuals with higher levels of educational attainment and regardless of their age ( two wage-earner, college educated, married couple families with children characterized the typical inter-state migrant to NH) made New Hampshire a much more attractive place for businesses to operate. The in-migration of “talent” fueled the state’s transition to a more sophisticated, technology dependent economy. But there is less state-to-state migration everywhere today and national and regional population, demographic, and labor force growth make it much less likely that NH will continue to realize those benefits from its fiscal structure. In the coming decades as competition for labor increases because of limited growth in the labor force, stronger wage growth will be needed to attract a limited pool of labor. Taxing compensation (as NH’s BET does) will increase tax liabilities for many NH businesses even as higher wages limit their profitability. It is time for a discussion of NH’s business taxes, but that discussion needs to involve a lot more than just tax rates, credits, and how the rules apply to publicly traded companies.